Mother’s Day is just around the corner, so we thought that we would show you how to create this super fun and easy card using the wonderful First Edition Kale Washi Tapes! Gorgeous and green, this tape makes for a perfect rosette that you can give to your #1 Mum! Attach this rosette to the front of a card blank for a fun Mother’s Day card for a sweet surprise. 1. Die cut two of the medium-size scalloped circles and one of the scalloped circles from the First Edition Scalloped Circle Die set. 2. Add Perma-Fix tape to the back of one of the larger circles. 3. Fix pieces of the beautiful First Edition Kale Washi Tape in half and adhere them to the back of the circle. Tip: It is easier to make this by looking at the front of the badge, whilst adding the washi tape to the back so that you can see how the rosette is forming. 4. Add layers of washi tape until you are happy with the badge. 5. Take the second of the larger circles and adhere the safety pin to this with tape. 6. Adhere the smaller circle to the top of the larger circle to cover up the tape. 7. Adhere the circle with the pin to the back of the badge. 8. Adhere Simply Creative Alphabet Stickers to the front of the badge so that it says ‘#1 MUM’. Adhere the badge to the card with blue-tack to make it removable. You now have your finished Mother’s Day card ready to gift to the #1 Mum in your life! 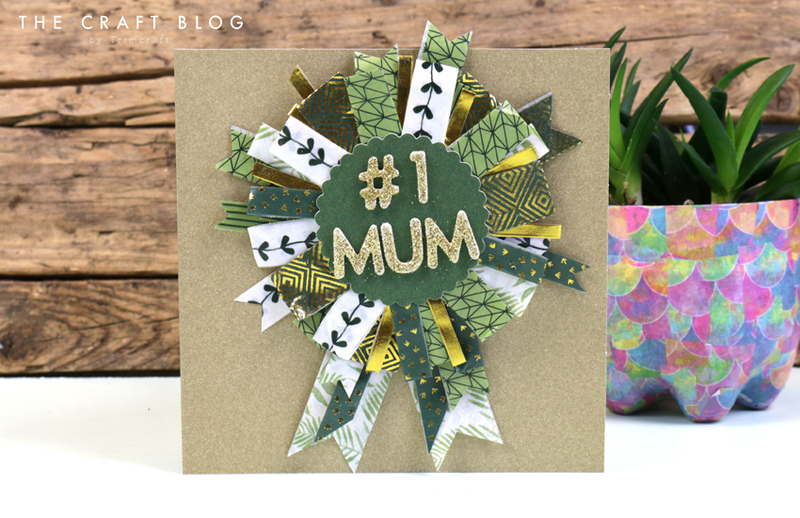 Will you be creating our #1 Mum Rosette Card? We’d love to see if you do, so don’t forget to #Trimcraft when uploading to social media and to share your projects in the Inspiration area. Fab Rosette badge with washi tape.